This article is about the pigment. For other uses, see Prussian blue (disambiguation). Not to be confused with Russian Blue. 18. Another name for the color is Berlin blue or, in painting, Parisian or Paris blue. Turnbull's blue is the same substance, but is made from different reagents, and its slightly different color stems from different impurities. Prussian blue pigment is significant since it was the first stable and relatively lightfast blue pigment to be widely used following the loss of knowledge regarding the synthesis of Egyptian blue. European painters had previously used a number of pigments such as indigo dye, smalt, and Tyrian purple, which tend to fade, and the extremely expensive ultramarine made from lapis lazuli. 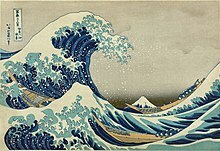 Japanese painters and woodblock print artists, likewise, did not have access to a long-lasting blue pigment until they began to import Prussian blue from Europe. 2O) was probably synthesized for the first time by the paint maker Diesbach in Berlin around 1706. Most historical sources do not mention a first name of Diesbach. Only Berger refers to him as Johann Jacob Diesbach. The pigment is believed to have been accidentally created when Diesbach used potash tainted with blood to create some red cochineal dye. The original dye required potash, ferric sulfate, and dried cochineal. Instead, the blood, potash, and iron sulfate reacted to create a compound known as iron ferrocyanide, which, unlike the desired red pigment, has a very distinct blue hue. It was named Preußisch blau and Berlinisch Blau in 1709 by its first trader. The pigment replaced the expensive lapis lazuli and was an important topic in the letters exchanged between Johann Leonhard Frisch and the president of the Prussian Academy of Sciences, Gottfried Wilhelm Leibniz, between 1708 and 1716. It is first mentioned in a letter written by Frisch to Leibniz, from March 31, 1708. Not later than 1708, Frisch began to promote and sell the pigment across Europe. By August 1709, the pigment had been termed Preussisch blau; by November 1709, the German name Berlinisch Blau had been used for the first time by Frisch. Frisch himself is the author of the first known publication of Prussian blue in the paper Notitia Coerulei Berolinensis nuper inventi in 1710, as can be deduced from his letters. Diesbach had been working for Frisch since about 1701. To date, the Entombment of Christ, dated 1709 by Pieter van der Werff (Picture Gallery, Sanssouci, Potsdam) is the oldest known painting where Prussian blue was used. Around 1710, painters at the Prussian court were already using the pigment. At around the same time, Prussian blue arrived in Paris, where Antoine Watteau and later his successors Nicolas Lancret and Jean-Baptiste Pater used it in their paintings. In 1731, Georg Ernst Stahl published an account of the first synthesis of Prussian blue. The story involves not only Diesbach, but also Johann Konrad Dippel. Diesbach was attempting to create a red lake pigment from cochineal, but obtained the blue instead as a result of the contaminated potash he was using. He borrowed the potash from Dippel, who had used it to produce his "animal oil". No other known historical source mentions Dippel in this context. It is, therefore, difficult to judge the reliability of this story today. In 1724, the recipe was finally published by John Woodward. In 1752, French chemist Pierre J. Macquer made the important step of showing Prussian blue could be reduced to a salt of iron and a new acid, which could be used to reconstitute the dye. The new acid, hydrogen cyanide, first isolated from Prussian blue in pure form and characterized in 1782 by Swedish chemist Carl Wilhelm Scheele, was eventually given the name Blausäure (literally "blue acid") because of its derivation from Prussian blue, and in English became known popularly as Prussic acid. Cyanide, a colorless anion that forms in the process of making Prussian blue, derives its name from the Greek word for dark blue. From the beginning of the 18th century, Prussian blue was the predominant uniform coat color worn by the infantry and artillery regiments of the Prussian Army. As Dunkelblau (dark blue), this shade achieved a symbolic importance and continued to be worn by German soldiers for ceremonial and off-duty occasions until the outbreak of World War I, when it was superseded by greenish-gray field gray (Feldgrau).
. The iron in this material is all ferrous, hence the absence of deep color associated with the mixed valency. Oxidation of this white solid with hydrogen peroxide or sodium chlorate produces ferricyanide and affords Prussian blue. Despite the fact that it is prepared from cyanide salts, Prussian blue is not toxic because the cyanide groups are tightly bound to iron. Other polymeric cyanometalates are similarly stable with low toxicity. In former times, the addition of iron(II) salts to a solution of ferricyanide was thought to afford a material different from Prussian blue. The product was traditionally named Turnbull's blue (TB). X-ray diffraction and electron diffraction methods have shown, though, that the structures of PB and TB are identical. The differences in the colors for TB and PB reflect subtle differences in the methods of precipitation, which strongly affect particle size and impurity content. 2O, where x = 14–16. The structure was determined by using IR spectroscopy, Mössbauer spectroscopy, X-ray crystallography, and neutron crystallography. Since X-ray diffraction cannot easily distinguish carbon from nitrogen in the presence of heavier elements such as iron, the location of these lighter elements is deduced by spectroscopic means, as well as by observing the distances from the iron atom centers. ions; insoluble PB has interstitial water, instead. 6 subunits are vacant (empty), leaving three such groups. The empty nitrogen sites are filled with water molecules, instead, which are coordinated to Fe(III). The Fe(II) centers, which are low spin, are surrounded by six carbon ligands in an octahedral configuration. The Fe(III) centers, which are high spin, are octahedrally surrounded on average by 4.5 nitrogen atoms and 1.5 oxygen atoms (the oxygen from the six coordinated water molecules). Additional eight (interstitial) water molecules are present in the unit cell, either as isolated molecules or hydrogen bonded to the coordinated water. The composition is notoriously variable due to the presence of lattice defects, allowing it to be hydrated to various degrees as water molecules are incorporated into the structure to occupy cation vacancies. The variability of Prussian blue's composition is attributable to its low solubility, which leads to its rapid precipitation without the time to achieve full equilibrium between solid and liquid. Prussian blue is strongly colored and tends towards black and dark blue when mixed into oil paints. The exact hue depends on the method of preparation, which dictates the particle size. The intense blue color of Prussian blue is associated with the energy of the transfer of electrons from Fe(II) to Fe(III). Many such mixed-valence compounds absorb certain wavelengths of visible light resulting from intervalence charge transfer. In this case, orange-red light around 680 nanometers in wavelength is absorbed, and the reflected light appears blue as a result. Like most high-chroma pigments, Prussian blue cannot be accurately displayed on a computer display. PB is electrochromic—changing from blue to colorless upon reduction. This change is caused by reduction of the Fe(III) to Fe(II), eliminating the intervalence charge transfer that causes Prussian blue's color. Because it is easily made, cheap, nontoxic, and intensely colored, Prussian blue has attracted many applications. It was adopted as a pigment very soon after its invention and was almost immediately widely used in oil, watercolor, and dyeing. The dominant uses are for pigments: about 12,000 tonnes of Prussian blue are produced annually for use in black and bluish inks. A variety of other pigments also contain the material. Engineer's blue and the pigment formed on cyanotypes—giving them their common name blueprints. Certain crayons were once colored with Prussian blue (later relabeled midnight blue). It is also a popular pigment in paints. Similarly, Prussian blue is the basis for laundry bluing. In the late 1800s, Rabbi Gershon Henoch Leiner, the Hasidic Rebbe of Radzin, dyed techeiles with prussian blue. Even though some have questioned its identity as techeiles because of its artificial production, and had Rabbi Leiner been aware of this he would have retracted from his position that his dye was techeiles, others have disputed this and claimed that Rabbi Leiner would not have retracted. Nanoparticles of prussian blue are used as pigments in some cosmetics ingredients according to the European Union Observatory for Nanomaterials. from those poisoned in the Goiânia accident. Prussian blue is a common histopathology stain used by pathologists to detect the presence of iron in biopsy specimens, such as in bone marrow samples. The original stain formula, known historically (1867) as "Perls' Prussian blue" after its inventor, German pathologist Max Perls (1843–1881), used separate solutions of potassium ferrocyanide and acid to stain tissue (these are now used combined, just before staining). Iron deposits in tissue then form the purple Prussian blue dye in place, and are visualized as blue or purple deposits. The formula is also known as Perls' Prussian blue and (incorrectly) as Perl's Prussian blue. Engineer's blue, Prussian blue in an oily base, is the traditional material used for spotting metal surfaces such as surface plates and bearings for hand scraping. A thin layer of nondrying paste is applied to a reference surface and transfers to the high spots of the workpiece. The toolmaker then scrapes, stones, or otherwise removes the marked high spots. Prussian blue is preferable because it will not abrade the extremely precise reference surfaces as many ground pigments may. Prussian blue is formed in the Prussian blue assay for total phenols. Samples and phenolic standards are given acidic ferric chloride and ferricyanide, which is reduced to ferrocyanide by the phenols. The ferric chloride and ferrocyanide react to form Prussian blue. Comparing the absorbance at 700 nm of the samples to the standards allows for the determination of total phenols or polyphenols. ^ a b c Dunbar, K. R. & Heintz, R. A. (1997). Chemistry of Transition Metal Cyanide Compounds: Modern Perspectives. Progress in Inorganic Chemistry. 45. pp. 283–391. doi:10.1002/9780470166468.ch4. ISBN 9780470166468. ^ a b Bartoll, Jens. "The early use of prussian blue in paintings" (PDF). 9th International Conference on NDT of Art, Jerusalem Israel, 25–30 May 2008. Retrieved 2010-01-22. ^ Berger, J. E. (c.1730) Kerrn aller Fridrichs=Städtschen Begebenheiten. Staatsbibliothek zu Berlin – Preußischer Kulturbesitz, Handschriftenabteilung, Ms. Boruss. quart. 124. ^ Finlay, Victoria (2014). The Brilliant History of Color in Art. J. Paul Getty Museum. pp. 86–87. ISBN 978-1606064290. ^ Stahl, G. E. (1731) Experimenta, Observationes, Animadversiones CCC Numero, Chymicae et Physicae. Berlin. pp. 281–283. ^ Woodward, J. (1724–1725). "Praeparatio coerulei Prussiaci es Germanica missa ad Johannem Woodward." [Preparation of Prussian blue sent from Germany to John Woodward...]. Philosophical Transactions of the Royal Society of London. 33 (381): 15–17. doi:10.1098/rstl.1724.0005. ^ Brown, John (1724–1725). "Observations and Experiments upon the Foregoing Preparation". Philosophical Transactions. 33 (381): 17–24. Bibcode:1724RSPT...33...17B. doi:10.1098/rstl.1724.0006. JSTOR 103734. . The recipe was subsequently published in Geoffroy, Étienne-François (1727) "Observations sur la Preparation de Bleu de Prusse ou Bleu de Berlin," Mémoires de l'Académie royale des Sciences année 1725. Paris. pp. 153–172. ^ Lowengard, Sarah (2008) Chapter 23: Prussian Blue in The Creation of Color in Eighteenth-Century Europe. New York, New York: Columbia University Press. ISBN 0231124546. ^ Macquer, Pierre-Joseph (1752) "Éxamen chymique de bleu de Prusse," Mémoires de l'Académie royale des Sciences année 1752 ... (Paris, 1756), pp. 60–77. This article was reviewed in "Sur le bleu de Prusse," Histoire de l'Académie royale des Sciences... (1752), (Paris, 1756), pp. 79–85. ^ Scheele, Carl W. (1782) "Försök, beträffande det färgande ämnet uti Berlinerblå" (Experiment concerning the coloring substance in Berlin blue), Kungliga Svenska Vetenskapsakademiens handlingar (Royal Swedish Academy of Science's Proceedings), 3: 264–275 (in Swedish). Reprinted in Latin as: "De materia tingente caerulei berolinensis" in: Carl Wilhelm Scheele with Ernst Benjamin Gottlieb Hebenstreit (ed.) and Gottfried Heinrich Schäfer (trans. ), Opuscula Chemica et Physica (Leipzig ("Lipsiae"), (Germany): Johann Godfried Müller, 1789), vol. 2, pages 148–174. ^ a b Völz, Hans G. et al. (2006) "Pigments, Inorganic" in Ullmann's Encyclopedia of Industrial Chemistry. Wiley-VCH, Weinheim. doi:10.1002/14356007.a20_243.pub2. ^ Ozeki, Toru. ; Matsumoto, Koichi. ; Hikime, Seiichiro. (1984). "Photoacoustic spectra of prussian blue and photochemical reaction of ferric ferricyanide". Analytical Chemistry. 56 (14): 2819. doi:10.1021/ac00278a041. ^ Izatt, Reed M.; Watt, Gerald D.; Bartholomew, Calvin H.; Christensen, James J. (1970). "Calorimetric study of Prussian blue and Turnbull's blue formation". Inorganic Chemistry (Submitted manuscript). 9 (9): 2019. doi:10.1021/ic50091a012. ^ Herren, F.; Fischer, P.; Ludi, A.; Haelg, W. (1980). "Neutron diffraction study of Prussian Blue, Fe4[Fe(CN)6]3·xH2O. Location of water molecules and long-range magnetic order". Inorganic Chemistry. 19 (4): 956. doi:10.1021/ic50206a032. ^ Lundgren, C. A.; Murray, Royce W. (1988). "Observations on the composition of Prussian blue films and their electrochemistry". Inorganic Chemistry. 27 (5): 933. doi:10.1021/ic00278a036. ^ Berrie, Barbara H. (1997). "Prussian Blue". In Artists' Pigments. A Handbook of their History and Characteristics, E. W. FitzHugh (ed.). Washington, DC: National Gallery of Art. ISBN 0894682563. ^ "Wayback Machine". web.archive.org. 8 April 2008. ^ "Questions and Answers on Prussian Blue". Retrieved 2009-06-06. ^ Formula for Perls' Prussian blue stain. Accessed April 2, 2009. Kraft, Alexander (2008). "On the discovery and history of Prussian blue" (PDF). Bull. Hist. Chem. 33 (2): 61–67.